Patrick Wemyss was born in Fife Scotland in about 1604. His mother was Elizabeth Preston sister of the 1 Earl of Desmond Richard Preston of Craigmiller Fife( see below for more details), who married Elizabeth Butler (Lady Ormond).Patrick's mother married a second time Richard Christie whom I believe resided in Kilkenny . According to James Graves 1874 (see downloads)who saw the papers the Danesfert Wemyss had in their possessions his father was another Sir Patrick Wemyss of Rumgally and Craig Hall, Fife ,Grandson of the Earl of Wemyss Sir David Wemyss of Wemyss who married Cecilia Ruthven. Their sons were John, James , Patrick, Andrew, David. Sir David's son Sir James married Margaret Melville and secondly Elizabeth Dune Durie.By Margaret he had only one sonwho made it to maturity and that was James. With Elizabeth they had Davis, George, Andrew, Henry, and Dr Ludovick but no mention of Patrick. Some queried James Graves and said that if it was Sir Patrick Wemyss of Rumgally and Craig Hall Fife then it must be the son of Sir Davis Wemyss and Cecelia. This Sir Patrick married Elizabeth Sandilands and on record they have David, William, John. She died in 1606 and her will only mention these three. However the Mormon site Familysearch.com has a Patrick Wemyss being born to Patrick and Elizabeth in 1591 . This could be Sir Patrick's father as we have his birth about 1604 and his sister Abigail was born 1610 so his date of birth could be later. The riddle continues! Patrick Wemys was Captain-Lieutenant to Earl of Ormond in the Army of King Charles and was a close associate of the Earl of Ormond from the 1620's. He was a first cousin of Elizabeth Preston Lady Ormond and indeed it is believed that it was Sir Patrick who introduced the couple at a party in London. Elizabeth was also a cousin of her husband Walter. Patrick married Mary Wheeler about 1634 at Queens County, Audoen's Church, Dublin, Ireland. Mary was a daughter of Jonah Wheeler the Bishop of Ossory; Kilkenny and through her he established many powerful local connections. They had five sons .She was buried: May 31, 1660, at St Canice Dublin. In 1639 he went to Scotland acting as messenger Between Ormond and Charles. As a member of Ormond's army he fought at Julianstown, Mellifont and On November 22, 1641, he entered Drogheda with 50 horses for its defence. He also fought at Kilrush in 1642 when it is reputed that his horse was shot from under him. In 1643 he acted as messenger to bring Ormond the Kings letter authorising him to negotiate a cessation with the Confederates. In December 1644 and January 1645 he was involved with Henry Moore's mother and others in a plot to capture Drogheda and hand it to the Scots. He was imprisoned for his actions and Ormond broke with him. From his prison he wrote to the King and Francis Hamilton. He claimed he had the support of Charles for his actions. In his letters to Colonel Wemys and to Major Crawford he stressed his Scottish origins. He was exchanged for Sir Henry Tichbourne in late 1645. In 1646 he was based in Ulster and in the following year he was Colonel of a regiment of horse. It was during this period that he was knighted. In 1654 he was a commissioner to raise assessments for Ireland and he was also an alderman of Kilkenny He was M.P for Kilkenny in 1661 the year in which he died. He was buried: May 31, 1661, St. Audoen's Church, Dublin, Ireland. Note: Patrick's father's name is unknown. Sir W. Frazer the author of Memorials of the Family of Wemyss of Wemyss has references to many Patrick's, but none could be identified with him or any that married Elizabeth Preston who is recorded as Patrick's mother. Letter from Sir Patrick Wemyss to Earl of Ormond 29th November 1641. I will now tell you of our misfortune. We lodged last night at Balrederie (Balrothery,), as my officers could not make the men march to Drogheda. We were informed that the enemy were upon us, but they did not fall on us. Next day on the march, we sent out scouts and saw a few rebels, but after crossing the Julanstowne bridge, I saw them advancing towards us in as good order as ever I saw any men. I viewed them all, and to my conjecture they were not less than 3,000 men. They had three troops of launciers, two troops that had pistols and two field pieces. I advised the foot captains to draw their men within the field just opposite where they were, for when we first did see them, we were marching in a dirty lane, and a high ditch on every side of us. So that my persuasion prevailed with them, they drew up themselves handsomely. I drew up the troops on their front, and told the captains that we were engaged in honour to charge them, and that I would charge them first with those horse I had. They promised faithfully to second me. But when I made the trumpet sound, the rebels advanced towards us in five great bodies of foot; the horse, being on both wings, a little advance before the foot; but just as I was going to charge, the troop cried unto me and told me the foot had left their officers, thrown down their arms, and took themselves to running. It was useless to fight, so I withdrew as best I could and escaped with a loyal remnant to Drogheda. Two of my troop whose horses went lame were left behind. I hear however that they are safe, except for their clothes, which were taken from them, not by the rebels, but by natives as they passed through the village. All our arms and ammunition are in the rebel's hands. We can get no food here for man or horse. P.S- There march upon every division of the rebels a friar or a priest. I do perceive here they do too much undervalue the rebels: for believe me, they will find them no such contemptible men. Journal of the House of Commons: volume 4: 1644-1646 (1802), pp. 293-95. Resolved, &c. That this House doth approve of the Exchange of Sir Robert Meredith, the Lady Moore, Sir Patrick Weymes, Sir Robert Hannay, Captain Ponsonby, Captain Wentworth, Lieutenant Draper, Mr. Batten, Mr. Towneley, Lieutenant Towneley, and Quartermaster Hatch, now Prisoners, or at Liberty upon Bail, in England and Ireland, to the Enemy, to be exchanged for the Lord Brabason, Sir Henry Titchborne, and Sir James Ware, now Prisoners to the Parliament, in the Tower of London: And that the said Sir Robert Meredith shall be at his Liberty to remain free from Restraint in Ireland, or to come into this Kingdom, which he pleaseth: And that, the said Lord Brabason, Sir Hen. Titchborne, and Sir James Ware, giving Security to the Lieutenant of the Tower for Performance of this Exchange, they be thereupon freed from Imprisonment. The prelude to the planned Siege of Drogheda 1641 by northern counties insurgents led by Sir Phelim O'Neil and supporters from Cavan and Monaghan to lay siege to the strategic garrison, grain store and seaport. Insurgents during their plan to unsettle English rule in Ireland, had already attacked several towns and villages within the Pale including the palace of the Protestant Bishop of Meath and the burning of Navan and Athboy. Either by chance or otherwise the insurgents came upon an untrained and hastily raised force of Government soldiers, largely composed of planter refugees from the northern counties sent against them. The two sides met at the bridge at Julianstown. The British commander gave the order to counter march, which the half trained recruits misinterpreted as a march to the rear. The British army began slowly edging backwards. However, the rebel force believed that the British had shouted contúirt bháis! (danger of death). The Irish, up on hearing this and seeing the panic and confusion amongst the British force let loose with a war cry and charged with unyielding ferocity. What followed was a simple rout. The soldiers attempted to hold them off by firing in volleys, but were unable to co-ordinate their actions and panicked when they saw the rebels bearing down on them. Many threw down their muskets and ran away, the remainder being either killed or captured. 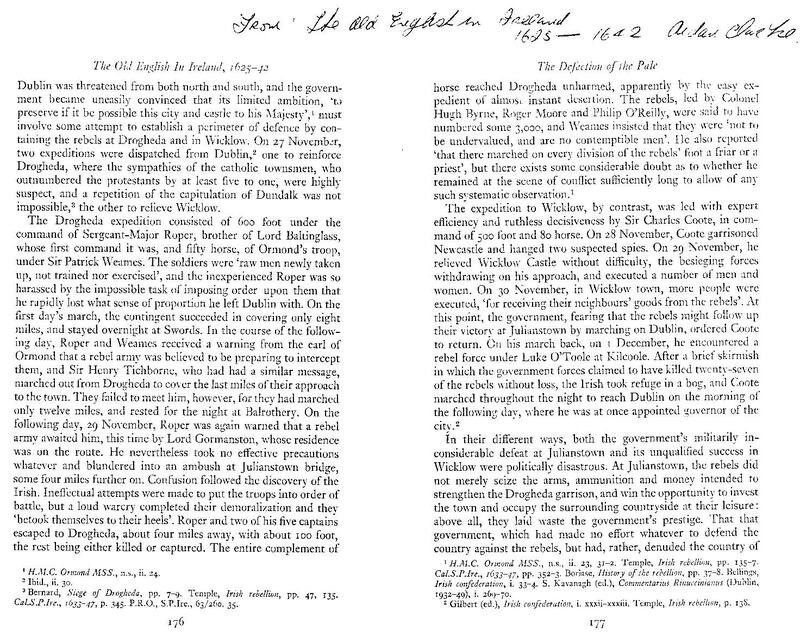 One disputed source tells that the rebels spared the Irish in the soldier's ranks, but killed the English and Scots. It is noted from the Cavan depositions that several of those men killed at Julianstown were in fact refugees who had joined the ranks of the army, having previously been robbed and turfed out of their homes by the insurgents. Richard Preston, (died 28 October 1628)1st Earl of Desmond married Elizabeth Butler, daughter of Thomas Butler, 10th Earl of Ormonde and Hon. Elizabeth Sheffield, after December 1613.2 He died on 28 October 1628. Richard Preston, 1st Earl of Desmond gained the title of Lord Dingwall.1 He was created 1st Earl of Desmond [Ireland] on 24 July 1619. Elizabeth Preston, Baroness Dingwall+ b. 25 Jul 1615, d. 21 Jul 1684 She and George Feilding, 1st Earl of Desmond were engaged circa 1622.2 She married James Butler, 1st Duke of Ormonde, son of Thomas Butler, Viscount Thurles and Elizabeth Poyntz, in September 1629. She died on 21 July 1684 at age 68. Elizabeth Preston, Baroness Dingwall gained the title of Baroness Dingwall, suo jure.1 Her married name became Butler. Earl of Musgrave married Edmund sheffield his only daughter elizabeth married Thomas butler 10 the Earl of Ormonde and Ossory she had an only daughter Elizabeth Butler who married Richard Preston Earl of Desmond whose only child Elizabeth Preston married James Butler 12th Earl of OrmondRichard was Earl of Dingwell 1st then Earl of Desmond 1619 friend to King james. This gentleman, first Lord Dingwall of the second creation, appears to have been a younger son of Preston of Whitehill, of the family of Preston of Preston and Craigmillar (see PRESTON, surname of). He was a great favourite of King James the Sixth, by whom he was knighted, and appointed one of the gentlemen of his bedchamber. On the accession of James to the English throne, he attended his majesty to London, and was made one of the knights of the Bath at his coronation, 25th July 1603. In 1607 he had the constabulary of Dingwall bestowed upon him, and was created a peer of Scotland by the title of Lord Dingwall, as already stated, and his peerage confirmed by charter of 8th June 1609, to him and his heirs whatsoever. He married (the match being brought about by the king) Lady Elizabeth Butler, only surviving child of Thomas tenth earl of Ormond and Ossory, widow of her cousin-german, Viscount Tulleophelim, and on the earl's death in 1614, he took possession of his landed property, in prejudice of the rights of the heir male, Walter Butler, eleventh earl of Ormond, in whose favour a settlement had been made by the late earl. For not submitting to an adverse decision of the king declaring Lord Dingwall entitled to the estate, the earl was committed to the Fleet prison, where he was detained eight years, and only obtained his liberty on his majesty's death. Lord Dingwall had one child, Elizabeth, whom the duke of Buckingham intended for the wife of his nephew, George Fielding, second son of William first earl of Denbigh, and with a view to their marriage, he was created Lord Fielding in the Irish peerage, and Lord Dingwall, Viscount Callan and earl of Desmond in the same peerage, with remainder to his intended son-in-law, George Lord Fielding, 20th November 1622. The match, however, was frustrated by the assassination of the duke of Buckingham and the death of Lord Dingwall (earl of Desmond), the latter being drowned on the on the passage betwixt Dublin and Holyhead, 28th October 1628. The barony of Dingwall devolved on his daughter, and the earldom of Desmond on Lord Fielding, in whose family it still remains. His daughter, Lady Elizabeth Preston, baroness of Dingwall, born 25th July 1615, married in 1629, when she was little more than fourteen years of age, James, Lord Thurles, (grandson and heir-apparent of Walter, earl of Ormond), afterwards the great duke of Ormond. His Grace died 21st July 1668, and was buried with his duchess (died 21st July 1684) in Westminster Abbey. Their grandson, James, second duke of Ormond, born 29th April 1665, was an eminent military commander, and commander-in-chief of all the British forces at home and abroad. He was also for several years lord-lieutenant of Ireland. Having preferred a claim to the title of Lord Dingwall in Scotland, the House of Lords, on 2d March 1711, ordered it to be referred to their committee for privileges. He voted as Lord Dingwall at two elections in 1713, though his title was not admitted by the House till 8th July 1714. His Grace was impeached for high treason 21st June 1715, and retiring 8th August into France, was forfeited, when the title of Baron Dingwall was attained. He died 16th November 1745, in the 71st year of his age, without surviving issue. The arrival and influence of a Protestant family upon the cultural landscape of Co. Kilkenny, Ireland,from the 17th - 19th Centuries. Recent archaeological fieldwork in advance of the Dublin-Waterford road scheme has shed light on the Wemyss family of Danesfort, Co. Kilkenny. Sir Patrick Wemyss was granted land in Danesfort by Walter Ormond in 1629. The discovery of two trade tokens on the excavations offers a direct link to historical records and life at Danesfort demesne and its relationship with neighbouring towns in the 17th Century. The discovery of an 18th Century house foundation complete with a cellar, two brick ovens, a rotary quern and a lime kiln indicates changes in land use in the demesne over time. A later generation of Wemyss's oversaw the removal of these building and the setting out of wooded parkland complete with a stone footpath. The talk seeks to demonstrate how the arrival of a Protestant family into an Old English cultural milieu fundamentally altered the physical and cultural landscape of the area. Patrick Wemyss (Wemys, Weames, Weemes, Waymes) was a close associate of the Earl of Ormond from the 1620's. He was a cousin of Elizabeth Preston, Lady Ormond and indeed it is believed that it was Sir Patrick who introduced the couple. He came to Ireland in about 1629 and Walter Ormond granted him lands at Danesfort ad Bennettsbridge. They had land deals in the counties of Kilkenny, Tipperary and Carlow. He was made a freeman of Waterford in 1633 and sheriff of Kilkenny from 1631 to 1635. Through his marriage to Mary Wheeler who was a daughter of Jonah Wheeler, the Bishop of Ossory; and through her he established many powerful local connections. In 1639 he went to Scotland acting as messenger Between Ormond and Charles. As a member of Ormond's army he fought at Julianstown, Mellifont and Drogheda in 1641/2. He also fought at Kilrush in 1642 when it is reputed that his horse was shot from under him. In 1643 he acted as messenger to bring Ormond the Kings letter authorising him to negotiate a cessation with the Confederates. In December 1644 and January 1645 he was involved with Henry Moore's mother and others in a plot to capture Drogheda and hand it to the Scots. He was imprisoned for his actions and Ormond broke with him. From his prison he wrote to the King and Francis Hamilton. He claimed he had the support of Charles for his actions. In his letters to Col.Wemys and to Major Crawford he stressed his Scottish origins. He was exchanged for Sir Henry Tichbourne in late 1645. In 1646 he was based in Ulster and in the following year he was Colonel of a regiment of horse. It was during this period that he was knighted. In 1654 he was a commissioner to raise assessments for Ireland and he was also an alderman of Kilkenny He was M.P for Kilkenny in 1661 the year in which he died. Patrick's father's name is unknown. Sir W. Frazer the author of Memorials of the Family of Wemyss of Wemyss has references to many Patricks, but none could be identified with him or any that married Elizabeth Preston who is recorded as Patrick's mother.